Ecological Dry Cleaning in Edinburgh. 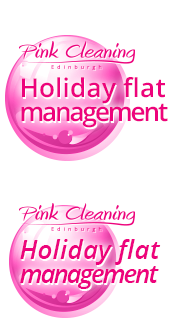 Pink Eco Clean is the first ecological dry cleaning in Edinburgh and in the whole of Scotland working in the Lagoon System. Our methods are based on Lagoon technology by Electrolux. The method which we use relies on washing fabrics in water in low temperatures (around 35°C degrees) using biodegradable detergents and colagen which protects fabrics from any damage. The effect of this method is incredible cleanliness and fresh fragrance. Unlike traditional chemical laundrettes, we do not use any environmentally harmful and aggressive detergents. We do all washing on our own premises. Our customers’ clothes and other belongings never leave our main office unless the clients order home delivery. Modern System Lagoon uses water as a natural dissolvent. The use of collagen means that the fibres do not absorb water and thanks to it we avoid damaging delicate fibres. The chemical launderettes which are using a carcinogenic dissolvent called Ethylene Tetrachloride are slowly disappering and making way for the latest developments in technology which are more customer and environmentally friendly. Woolmark concern warrants the quality of Lagoon System and recommends it as the best system to care of their products. Lagoon System cares and protects delicate fabrics and that is why it represents a unique alternative to chemical dry cleaning. The specialised devices and washing machines used for finishing and biodegradable detergents are the enviromentally friendly solution to the professional cleaning of wool, silk, viscose and fabrics which are normally only suitable for chemical cleaning. Fabrics that are cleaned in Lagoon System have a pleasant, fresh fragrance and are softer to the touch. The colours are lighter and the whites are much shinier than after a traditional washing. Our system is created from a combination of enviromentally friendly detergents and washing machines which have specially designed washing programmes. Most of the garments which arrive at our ecological laundry, have stains which must be removed. Before we pass the garment to the main cleaning section we remove stains by using special ecological detergents. In order to this we use a special spotting table with steam or air spotting guns which remove stains in a safe way. 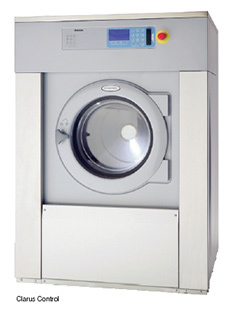 Professional washing machine with spinner and quadriolocular dispenser for detergents. 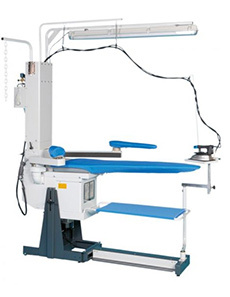 Electrical control system measures weight of the load and adjust its parameters to it. The speed of the spinner speed can reach up to 930 spins per minute and spins out the water with the strenght of 350G. Efficient gas tumblex drier with microproccessor moisture measuring system. 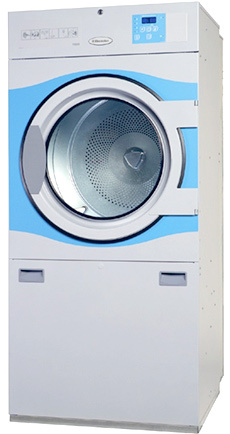 Wide range of drying programmes, reversible tumble spins and solid construction provide dry uncreased laundry. The use of callogen prevents the fibres from soaking water. Thanks to this technology we are able to dry the batch in the time of 15 minutes. 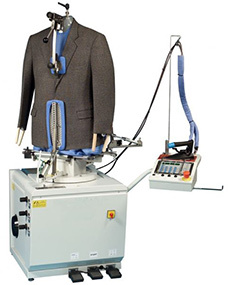 This device offers the potential for vertical and horizontal garment tensioning for perfect finish that includes suits, jackets, coats, outer jackets etc. The form of garment is created by the strong steam ventilation which is automatically blown to the inside of the mannequin. 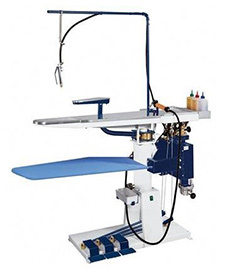 In order to provide more care for the smallest of finishing details, this device has its own light iron and anti-stretching system included. The shape of the device is constantly adjusting to the garment. This way we always achieve wonderfully ironed clothes. These unique tables with special shape provide for the perfect finish of even very difficult garments. The device includes the irregular vacuum fan which holds the garment in one place and dries it. Steam electric iron with teflon shoe and silicon iron rest enables superior ironing. These tables have their own lighting system allowing to notice even the smallest and the most delicate crease.